The price is all inclusive of hotel transfers (southern area of Phuket) the day of the course, PADI Freediver Touch and equipment. There are added costs when you require a pick up north of Patong. Not Available 15th December – 15th January. The PADI Basic Freediver course is a subset of the PADI Freediver course. It’s a great introduction to free diving, focusing on developing solid freediving skills. You learn basic freediving principles and focus on practicing breathhold techniques in a pool or confined water site. The PADI Basic Freediver course is the very first level of the four available PADI courses for freediving ( Basic FreeDiver, Freediver, Advanced Freediver and Master Freediver) It is a great first step for developing solid freediving skills. 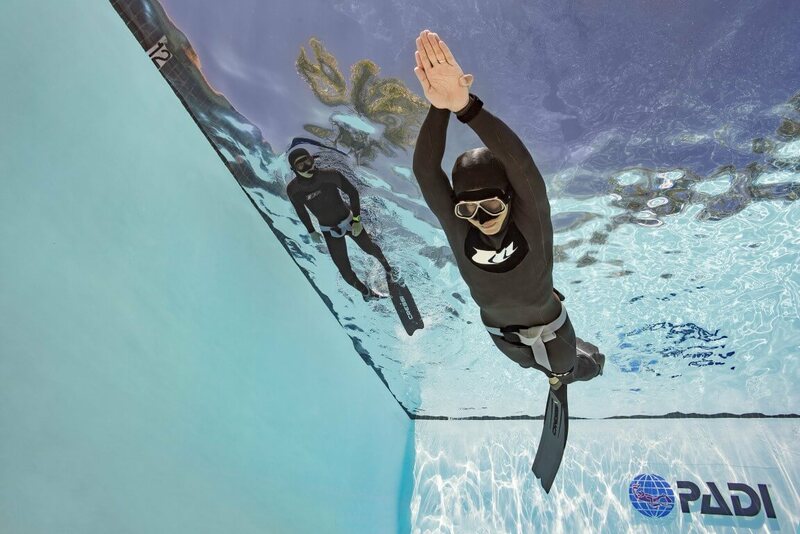 The Freediver Theory, which can be done with the downloadable PADI Freediver Touch on a smartphone or tablet. The theory will cover the basic’s of what happens to your body when you are free diving and the pressure changes at depth. Along with plenty of tips on how to improve your apnea technics. Confined Water Session – Pool where you will learn and develop your freediving technics that can then be applied to open water free diving. This will included breathing technics, proper buddy procedures, body positioning for freediving and rescue skills. Goal – static apnea of 90 seconds and dynamic apnea of 25 metres/80 feet. To enroll in the PADI Basic Freediver course you must be 12 years old or older. You need good swimming ability and need to be in good physical health. No prior experience with snorkeling, skin diving or freediving is required however. In the PADI Basic Freediver course, you learn to use a mask, snorkel and fins, and may also use a wetsuit and weight belt. Using gear designed specifically for freediving is best, like low volume mask’s and free diving snorkel, however in this course, you may simply be able to use snorkeling equipment you already own.